Fungi are flourishing here this fall. Each day brings unexpected appearances in places I don’t remember any having been the day before. Some new arrivals stick around for a few weeks while others are more ethereal, disappearing after only a day or two. I find myself constantly looking down as I walk our forest trails, to spot the latest pop-ups and check out the shape, size and colour variations of these mysterious life forms that are neither plant nor animal. The mushrooms are so profuse and ubiquitous that I can’t help but imagine vast, branching underground mycelia spanning the length and breadth or our property and beyond, spreading their filaments through the entire neighbourhood. I try to tread carefully so as not to step on any mushrooms, but with all the fallen leaves and forest litter, they’re not always easy to spot. Luckily – especially for someone who carries a camera – the underside of a freshly overturned gilled mushroom can be well worth a closer look. 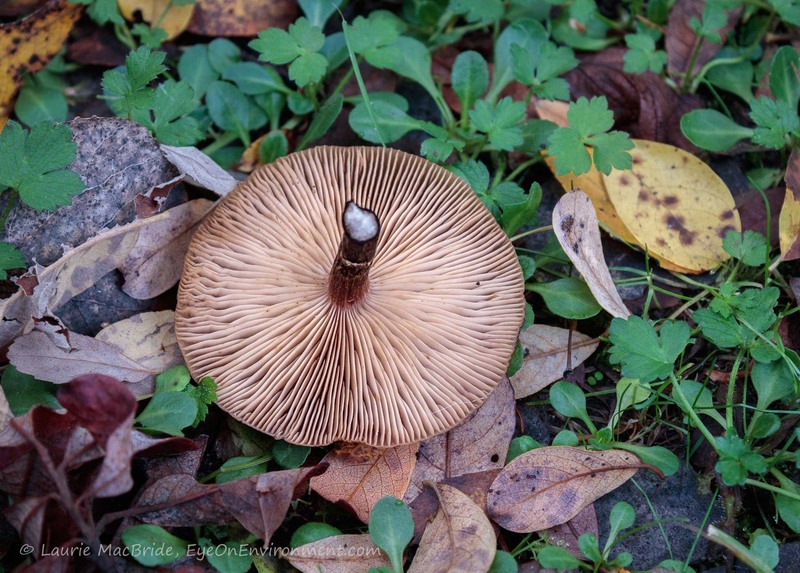 Posted by Laurie MacBride, Eye on Environment on November 12, 2018 in Forest and tagged autumn, environment, fall, fungi, imagination, mushrooms, nature, photography. Laurie: Yep! What a great fall for fungi.